African Americans hoped that their support for America's mission in World War I would earn them the respect of white America and the rights due them as citizens. When little changed in the aftermath of the conflict, they began asking for what white America was unwilling to give them. In 1919, black citizens of Charleston, South Carolina, asked the state's General Assembly to make an important change in the law that governed who could teach in Charleston's black schools. While their language was deferential—notice the request that the General Assembly "use the golden rule toward, for and over" black Charlestonians—these petitioners bravely sought control over their children's educational lives. While a small committee produced the petition, its authors insisted that the document came from the 10,000 African Americans who lived in Charleston. In doing so, they anticipated the mass movement to come. After World War II, as after World War I, many African Americans hoped that white Americans would acknowledge the hypocrisy of fighting for freedom abroad while denying it at home. But again, African Americans were disappointed; and again, many decided to insist that they receive the basic rights of citizenship. One way in which they did so was through the boycott, which in the mid 1950s and 1960s would become an effective tool of protest. Here we see that tool in use ten years before the bus boycott in Montgomery, Alabama, made it famous. Members of the Tenth Street Baptist Church in Washington, DC, wrote letters of protest to the manager of a department store that maintained a segregated soda fountain. Not only do these letters reveal the pent-up frustration of many black Americans, but they also show a coordinated effort to force change that would become an increasingly popular tactic as the civil rights movement grew. Why did the black citizens of Charleston choose to ask for civil rights by petition rather than demand them with protest? How would you characterize the language of the Charleston petition? Why did the petitioners employ such language? How do they want to change the law? Are the Charleston petitioners asking for separation or segregation? What does their request suggest about their attitude toward white Charleston? Why did soda fountains like the one in Lansburgh's Department Store become sites of protest? Why did the African Americans citizens of Washington choose to boycott Lansburgh's Department Store rather than sit in at its soda fountain? What information do the Lansburgh letters reveal about the protesters? What does the inclusion of return addresses suggest about the protesters? Based on a reading of the Pauli Murray chapter, what forces prevented organized protest among African Americans in the South? How did Murray's opponents justify their resistance to her entry into the law school? How does Murray's chapter highlight different generational and class approaches to race relations in the South? How does Murray's story illustrate the power and the limits of the legal approach to social reform? How does Murray present herself in this narrative? Do the actions described in these three readings constitute protest or resistance? How do the actors in these instances conceive of themselves as citizens and as African Americans? How do these three readings illustrate the complex and sometimes contradictory attitudes African Americans hold toward integration? 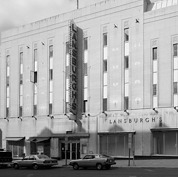 - Lansburgh's Department Store, 420-426 Seventh Street, NW, Washington, DC, photograph, n.d. (after 1940). Courtesy of the Library of Congress, Prints & Photographs Division, Historic American Buildings Survey/Historic American Engineering Record Collection. - Pauli Murray, b&w photograph entitled "Pauli Murray of New York, winner of a 1946 Mademoiselle Merit Award for signal achievement in law," 1946. Courtesy of the Library of Congress, Prints & Photographs Division, New York World-Telegram & Sun Photograph Collection #LC-USZ62-109644.